I think your guess about cheese tang is a good one. King Arthur Flour also makes “Vermont Cheese Powder”. ooo, thanks for the tip! I bet that would be delicious. am making this bread tonight…am to the point where I am waiting for the two separate loaves to rise. cannot wait to try it! love your blog!! well the verdict is in…and this bread fresh out of the oven is sinfully delicious! it’s great with roast beef on it, as well as lightly toasted and buttered. I would like to make it again with minced garlic worked into the dough with the shredded cheese! Thank you (although my waistline might not be thankful LOL) for the fantastic recipe – very easy to make! Minced garlic! Now you’re talking. I’m so glad that it worked out for you. It is good–and surprisingly easy! Oddly, I stumbled across this page just days after baking my first cheese bread in a couple of decades. I had a recipe I had from an old newspaper clipping, somewhere in the NYC area. Maybe the NY Post? Not as bright orange as Schrafft’s but tasty. Here’s the recipe, it is not my original recipe so feel free not to post it if that would be wrong. Just wanted you to see it. Cover; let rise in large bowl until doubled in size. Wow, this is really interesting! Thanks for sharing! Wow, thanks for this! I started baking this bread last year at the request of my aunt. I found a great recipe here: http://bit.ly/vkbJfK but never the official one. And yes, with a slice of roast beef it’s out of this world! Roasted garlic! That sounds sensational. You’re welcome and I’m glad it turned out well. Grilled chesee is probably my ultimate comfort food and there are SO many ways to make it! Love these variations. I think if you like water, go for water! it has nothing to do with the fact that someone likes water that has nothing to do with what i was trying to say….i was just telling u that u cant expect bread to taste like bread if u put milk,milk is not really put in bread only in bisqiuts or muffins etc etc etc……milk gives bread cake like texture………..if u r making a bread that u put fruits and nuts in then yes u use milk but u dont use milk in a plain bread and many people want the real bread texture not bread cake texture i am teaching u whats what…….thats all…….. I actually like to add milk to my my bread recipes. It adds extra layers of flavor to ny bread. Ok now I have to try this with a gluten free flour mix. Has anyone else tried it yet and have any tips for me? Thanks so much for the information about substituting the Kraft cheese powder for Cheese Tang. My father, George Le Sauvage worked for Schrafft’s for years and made the cheese bread at home for the Church Fair, friends and family. 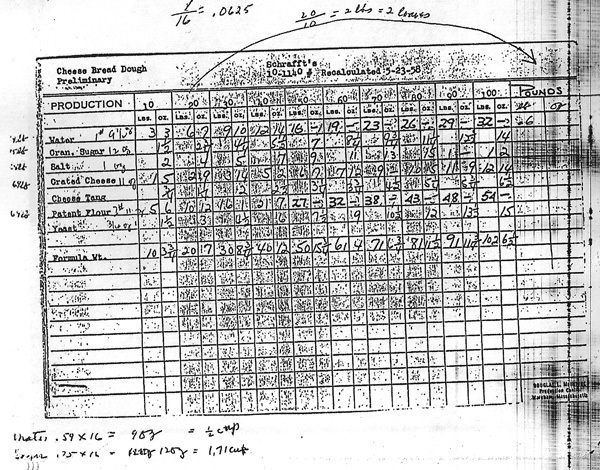 In fact he has the original production card document that was dug up by Joan that you imaged on your website! Now that I know I can substitute the Kraft powder for Cheese Tang, I’ll try to carry out Dad’s tradition and make Cheese Bread for friends and family. Thanks so much for you advice. Since you’ve had experience with the original bread, I’d be interested to here how the Kraft mac and cheese powder measures up! My roommates always save the powder for me so I can make them cheese bread. Started this project about 4:30 p.m. the loaves just came out of the oven a few minutes ago. They smell heavenly, but do not look near as “orange/yellow” as yours. I hope it tastes as good as it smells! Thanks! P.S. Are you going to be appearing in any more neat shows like appetite city? just wondering. So how did they taste in the end? My actually weren’t too orangy…and I think the color mostly came from the grated cheese, not the tang. At the moment I don’t have any tv food appearances on the radar, but I’m doing a lot of events locally in NYC, and I’d love to expand to Boston and DC. And who knows! Things are ever expanding in the FPF world. My family and I downed half of the first loaf just before bed that night…talk about cheesy dreams! The next day, my wife served her version of a Sloppy Joe over toasted slices..it was out of this world delicious! Kraft sells the powdered cheese separately in 1 lb bulk. So you dont have to buy the mac &cheese just to get the “cheese tang.”. Google search for “kraft powdered cheese” to find out how to get it. My mother-in-law told me about this recipe, thank you for having it up here!! I’ve already made it twice this week and blogged about it, too – http://tamdoll.blogspot.com/2012/03/sweets-shopping-bread.html. My mom was excited to remember the restaurant when I mentioned it to her also, but I had never been. I went to college in NYC in the 50’s and ate at Schraff’s every day…a ham salad sandwich on cheese bread. I think it was 35 cents. If you have the recipe for the ham salad I surely would appreciate it. I am 80 yrs. old now and have just started cooking again in earnest. I would love to capture the memory of this sandwich. Thanks for the cheese bread recipes. I don’t have it, but I am pretty sure it’s in the book When Everybody ate at Schrafft’s by Joan Kanel Slomanson, published 2007. try there! I got a Kitchenaid mixer from my husband for Christmas. I found this by accident, and am very excited to make it. The story about the recipe and cheese tang was entertaining! Thanks! I hope it turns out well! I was a very little girl when my cherished Aunt Pat would treat me to a day ‘downtown’, and we would shop at B.Altman. We would then have a ‘lady lunch’ at Schrafft’s. The cheese bread was always a special part of those days. I am thrilled that I can try to replicate the bread and relive the experience of my childhood. Thank you so very much. that is so sweet! I hope it turns out well! Baked the bread up this afternoon and my kids devoured it when they got home from school!….it was so good…and it was so easy to make…thank you so much for the recipe….my dream is to go to New York someday but until that day comes….if it ever does…..I’ll keep on making the bread and adding to my list of things to do in the Big Apple! I’m happy I could bring you a little taste of the big apple! You’ll get here. Baked the bread and used parmesan and garlic grated cheese. And rolled it in parmesan and romano cheese as well as shredded mozzarella cheese. It was a hit. Everyone left very satisfied. I don’t have any left for myself. I will definitely be baking it again. oh man…that sounds sooooo good! Mad Men sparked a memory of Schrafft’s in me and I found this site. My dad worked there for many years and brought the best of their many products home for the family to enjoy. I have missed the cheese bread so very much and tried other brands to fill this void but never found the match. I will have to try this recipe. My only comment, at this point, is that the Schrafft’s loaf did not have a swirl of color in it. 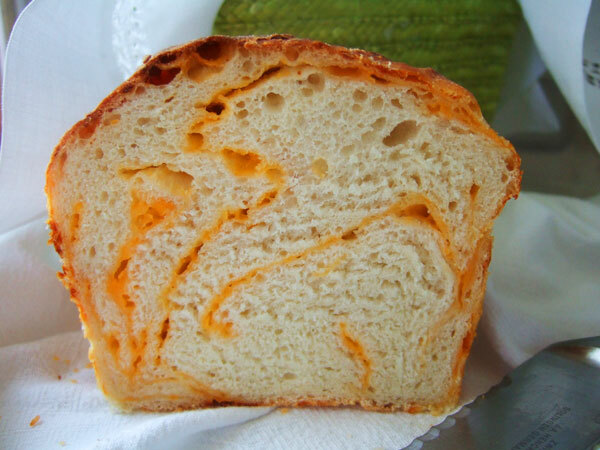 But as a loaf, a consistent very orange, cheddar like, color. And a small loaf of thinly sliced bread, not very different from Pepperage Farm brand shape and slices. And the favored way to eat it was toasted and buttered. Thank you all for sharing these tasty secrets. My mother was a baker at Schraffts in Boston. She said they made the cheese bread with powdered cheddar cheese. I don’t remember her using the word tang, So it can’t vouch for that. I’ve made it with the powdered cheese from the Kraft Macaroni and Cheese box, And it was delicious. Then I started buying powdered cheese in bulk which was very similar and made a delicious “Schrafft’s” cheese bread. Hello there! I came upon your recipe actually looking for a knockoff of Wegmans cheese bread. Your picture looked perfect and got such rave reviews I knew I had to try it! I made it last night, and although it tastes delicious it looks nothing like your picture. Do you use all-purpose flour or bread flour? I used bread flour and my loaf came out much denser and less “hole-y” – any suggestions? Thank you so much for digging this out of the archives. I love it! I used all purpose flour; but this sounds like a problem with your yeast not your flour. Did you proof the flour to make sure it was alive? If it is (it starts bubbling) then perhaps the environment was too cold. Set it in a warmer space, or give it longer to rise. For those of you who live on the West Coast and you live near a Winco Supermarket, in the bulk section they sell a cheese powder. That is what I am using to make this bread. Wonderful receipt by the way. I added some Asagio cheese to my batch because of the flavor. and I have made other cheese breads with it. It is a delicious receipt and will use it as an alternative to the regular bread I make and store away for the summer months when I cannot bake.